This workshop is scientific & technical, much like a summer school event, with more emphasis on international collaboration, project management, and other professional skills with the intention of training TMT’s future scientific and technical leaders. This workshop builds from TMT + ISEE’s pilot workshop in Hilo, Hawaii in December, 2016. 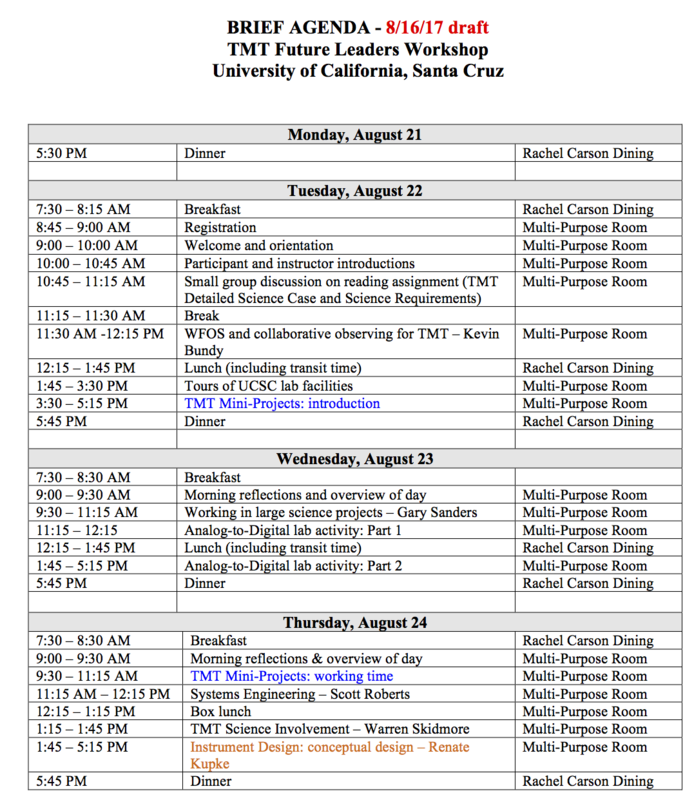 The agenda for that 4-day workshop can be viewed here. The workshop will include presentations on TMT science, instrumentation and engineering, as well as sessions focused on skills that are highly valued by TMT and large science projects in general. Sessions will give participants an opportunity to learn about and practice skills such as working effectively on interdisciplinary, international teams, defining technical requirements based on science goals, systems engineering, and managing projects. Participants will also tour historic Lick Observatory and the Laboratory for Adaptive Optics at UCSC, and learn about the roles these facilities play in piloting technologies for larger facilities like TMT. 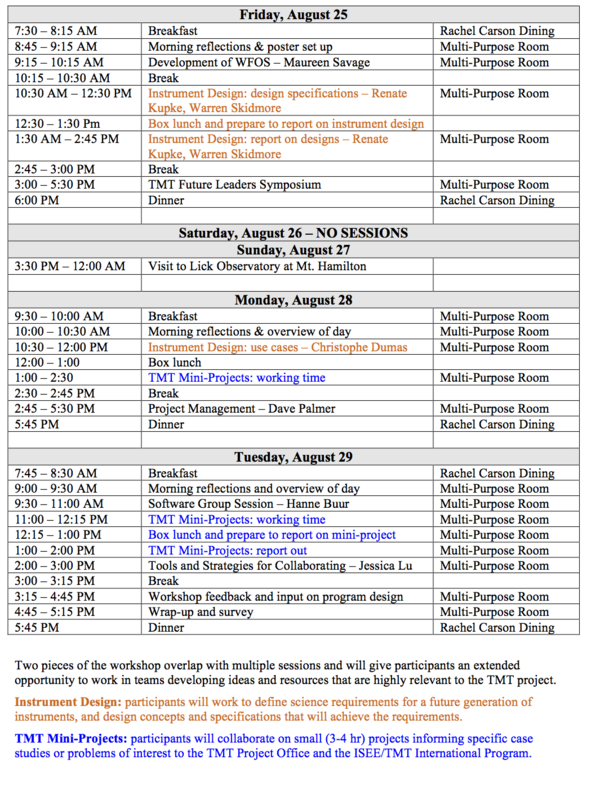 In addition to learning more about TMT and gaining new skills, workshop participants will also be helping TMT to design a program that will serve the needs of the project and future participants. The Thirty Meter Telescope is interested in building an international training program for its partnership. One of the primary goals of such a training program, other than passing on valuable skills from which all partners can benefit, will be to draw in graduate students and postdoctoral researchers who want to get involved with TMT in a variety of ways including engaging in real TMT projects. We are considering how to stimulate this international collaboration between current TMT leaders and program participants from across the partnership. Thank you for being a part of this process and helping to shape the future of TMT’s international training program!